Today, I will ask you the same question; maybe we can reason together and come out with an answer. 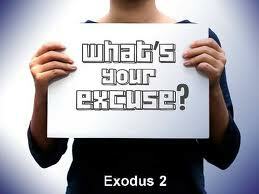 What will be your excuse on the last day, should you miss the rapture? Friends, let us stop looking at ourselves. If we look at ourselves, we will evaluate ourselves by ourselves. All of us came in this Kingdom with deficiencies; Sarah and Abraham were impatient. Gideon had inferiority complex. Moses staggered. Sampson married the wrong woman. Thomas was a doubter. Paul was a murderer. Elijah was moody. Jeremiah cried all the time. David was a murderer and adulterer. Timothy was timid. Peter denied Jesus three times. And if you look at me, I was an angry man, a liar, cheater, racist, inferiority complex, pretender, etc. But look at what God has done. He changed me and made me His own. I don’t know about you, maybe you are a fornicator, thief, pretender, doubter, cheater, drunkard, womanizer, drug addict, gossiper, liar, etc. I don’t know the label you have placed on yourself. But I do know that God sees you as a different person. He sees you as His child and doesn’t want you to spend eternity in Hell. He wants to change you today, I mean NOW. ARE YOU READY? No man can stand the wrath of God. Make the right choice today. What excuse do you have today? No matter the depth of your sins in the past, even now, Jesus is calling you; He is knocking at the door of your heart. He is saying your sin is no problem. All you need to do is to come to Him. He is the potter. He can re-mould you and make you anew. If you shun this so great salvation, WHAT EXCUSE CAN YOU GIVE ON THE LAST DAY, SHOULD YOU MISS THE RAPTURE? There will be NO SECOND CHANCE. Prev WHO ARE YOU GOD?